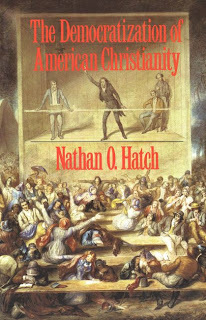 stylos: Book Review: Nathan Hatch, "The Democratization of American Christianity"
Book Review: Nathan Hatch, "The Democratization of American Christianity"
Nathan O. Hatch, The Democratization of American Christianity (Yale University Press, 1989): 312 pp. I finally got around to reading Nathan Hatch’s book The Democratization of American Christianity. Aside: Hatch is now President of my alma mater, Wake Forest. I had heard the book praised by the likes of D. J. Hart for its cogent historical explanation of the rise of egalitarian views and the decline of Calvinism in early American evangelicalism and wanted to read it for myself. From the start, Hatch argues “both that the theme of democratization is central to understanding the development of American Christianity, and that the years of the early republic are the most crucial in revealing that process” (p. 3). He concludes that the “central force” in American Christianity has been “its democratic or populist orientation” (p. 213). Hatch traces three ways in which popular religious movements in the early republic articulated a “democratic spirit”: (1) They denied “the age old distinction that set clergy apart as a separate order of men, and they refused to defer to learned theologians and traditional orthodoxies” (pp. 9-10); (2) They “empowered ordinary people by taking their deepest spiritual influences at face value rather than subjecting them to the scrutiny of orthodox doctrine and the frowns of respectable clergy” (p. 10); and (3) These “religious outsiders” had “little sense of their limitations” (p. 10). Hatch traces the influence of populist preachers like the Methodists Lorenzo Dow and Francis Asbury, the Baptist John Leland, the Restorationist Alexander Campbell, and the Mormon Joseph Smith. Of the Campbellites, for example, Hatch notes, “People were expected to discover the self-evident message of the Bible without any mediation from creeds, theologians, or clergymen not of their own choosing. This explicit faith that biblical authority could emerge from below, from the will of the people, was the most enduring legacy of the Christian movement” (p. 81). “While Backus never doubted the right of all to worship as they pleased, he was unconvinced that laymen could articulate their own theology. He defended the primacy of Calvinism and reminisced about ‘the imminent fathers of New England.’ Leland, on the other hand, rejected the idea of natural inequality in society—as if some were set apart to lead and others to follow. He depicted the typical clergyman as venal and conniving, rather than capable of rising above self-interest” (p. 99). The revolt against Calvinistic orthodoxy included a new interpretation of the Reformation concept of sola scriptura. Hatch notes: “For the Reformers, popular translations of the Bible did not imply that people were to understand the Scriptures apart from ministerial guidance” (p. 179). Likewise, Hatch continues, “It is equally clear that the eighteenth-century evangelicals John Wesley, George Whitefield, Jonathan Edwards, Isaac Backus, and others, did not think of viewing the Bible as a source of authority independent of theology and the mediations of clergymen” (p. 180). It was the egalitarian populists of the mid-18th century who began to set private interpretation of the Bible over against theology, history, and tradition. Hatch’s line of argument here anticipates Keith Mathison’s The Shape of Sola Scriptura (Canon Press, 2001). Hatch concludes the book with an epilogue in which he discusses “the recurring populist impulse in American Christianity” (pp. 210-219). The last line: “American Christianity continues to be powered by ordinary people and by the contagious spirit of their efforts to storm heaven by the back door” (p. 219). After a lifetime in conservative Baptist circles and 20 years in public ministry there is much with which I found to resonate in Hatch’s book. It helps explain how Baptists in America drifted from their Calvinistic roots. It also explains how moderate Baptists came to focus on “empowering the laity” and how even conservative Baptists continue down this track with egalitarian views of “every member ministry,” “democratic” views of church government, anticlericalism, and egalitarian views of church leadership. I read this book several years back. I found Hatch to be very helpful in his analysis of the way religion in general has evolved in this country and the philosophies that influenced its development. Thank you for serving us with this helpful review bringing this book to light.